Where N.C. rivers meet the sea, oysters can protect the land, fish, and human habitat. Every time a wave hits the shore, it erodes a bit of sand or rock. Unless something like a river deposits new material faster than the waves can pick it up, the land disappears inch by inch. Behind the thin (and thinning) protection of the Outer Banks, North Carolina’s inner coast erodes between one and seven feet a year, says UNC Institute of Marine Sciences professor Tony Rodriguez. We can’t stop erosion, but Rodriguez thinks we can slow it down—with oysters. Oyster reefs, which are piles of oysters attached to each other or to rocks and other hard material, were once plentiful in the sounds between the N.C. shoreline and the Outer Banks. They’ve declined because of harvesting, disease, and runoff from human habitation. But there are still lots of oyster larvae out in the water, Rodriguez says. They just need something to latch on to. Carrot Island, near Beaufort, North Carolina, is eroding about three feet a year, says UNC marine scientist Tony Rodriguez. More than 15 years ago, researchers at the Institute of Marine Sciences (IMS) built several reefs just six inches high in the waters near their facility in Morehead City, North Carolina. Other than taking some samples, the scientists left the reefs alone for more than 10 years. By then, Rodriguez had arrived at IMS. “Two researchers here said, ‘Come out and let’s look at these reefs—let’s see how they’ve done,’” he says. “So we spent a couple of days looking. And we noticed that some of the reefs had grown very large.” Some had grow n between one and two feet since they’d been built in the late 90s. Rodriguez, Niels Lindquist, and Joel Fodrie were fascinated—all the research they had read on oysters said that reefs just don’t grow that quickly. So they built 32 new, small reefs in different parts of the water and made detailed maps of all the reefs, old and new. They left the reefs alone for two years, then came back and made new measurements. 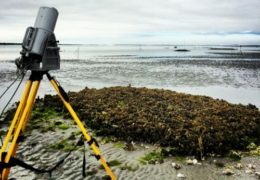 A laser scanner scatters a beam across the oyster reef and measures how long it takes the beam to come back to the scanner. 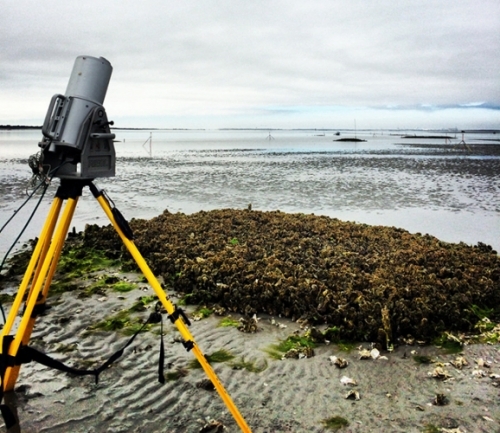 Rodriguez’s team maps the topography of oyster reefs in high detail. That’s the great thing about oyster reefs as erosion protection—as the sea level rises, more of the reef is underwater for longer periods of time, Rodriguez says, giving it the opportunity to keep growing. This means that oyster reefs could be a lower-cost alternative to bulkheads, which have to be repaired or replaced as they deteriorate. “There are lots of predictions of where the level of the sea will be in 2100,” Rodriguez says. “Some of the highest predictions are about six and a half feet. A lot of predictions are about three feet, and then some predictions are lower than that. Our reefs have the potential to grow four inches a year.” Four inches each year is more than enough growth to keep up with even the highest predictions of how much the sea will rise by 2100. Some parts of North Carolina’s inner coastline that are protected by the Outer Banks will see more erosion with time, Rodriguez says. “Right now, Pamlico Sound has almost no tides. But the Outer Banks are narrowing—eventually they’ll breach in a storm because they’re so narrow, and suddenly the sound will become more tidal.” One silver lining: the increasing tides might make the habitat even better for oysters. Oyster reefs are good for more than just shoreline protection. They also provide shelter for the fish and shrimp that North Carolinians catch, sell, and eat (see sidebar: Oysters in trouble). IMS builds its reefs out of piles of oyster shell. “Canneries shuck oysters and discard the shells,” Rodriguez says. “We buy these piles of shell from them, it’s delivered in trucks, and we haul it out to the site and spread it in these areas that we’ve mapped out. Once that dead shell is out there, the oyster larvae are just in the water, and they settle on the shell. Then the next year, they’re fairly large oysters.” Oyster reefs can also be made more cheaply from concrete topped with a layer of shell, Rodriguez says. Another part of the oyster habitat Rodriguez wants to figure out is how marshes help, and hurt, oyster reefs. IMS and other organizations promote planting marshes to prevent shorelines from eroding. 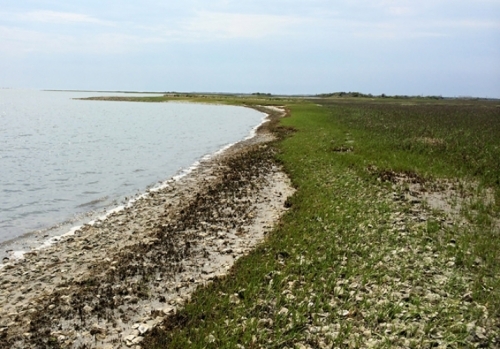 Oyster reefs, in turn, can protect the marshes. “It’s difficult for us to grow oyster reefs next to marshes,” Rodriguez says, “but we see oyster reefs growing that way naturally. We’re trying to figure out why that is. Maybe the reef established itself and grew big, and then the marsh established itself later?” The researchers are studying how to grow healthy marshes and oyster reefs side by side. 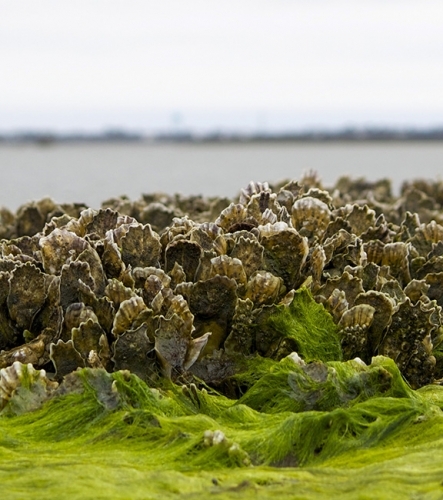 "Oyster reefs can outpace sea-level rise"